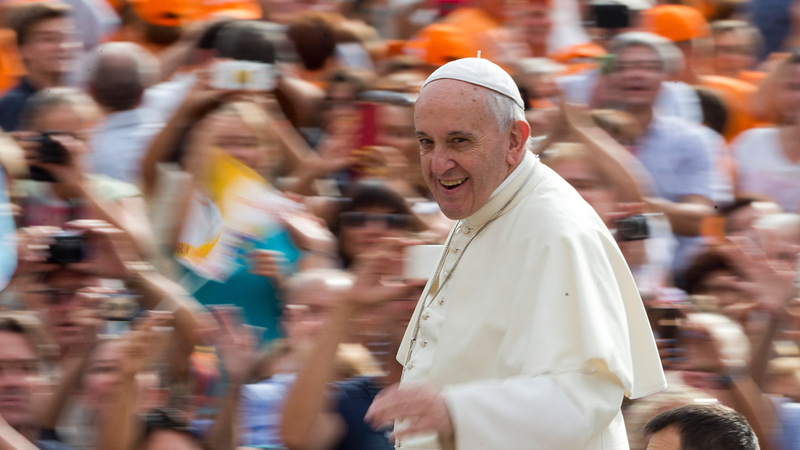 Pope Francis is making his first-ever visit to the United States, September 22-27, 2015. He will be participating in events in Washington D.C. and New York before heading to Philadelphia for the World Meeting of Families and then returning to Rome. 4 p.m.: Pope Francis arrives at Joint Base Andrews, where he will be greeted by President Barack Obama. 9:15 a.m.: Pope Francis meets with President Obama at the White House. 11 a.m.: Papal Parade along the National Mall. 11:30 a.m.: Prayer at Saint Matthew's Cathedral with U.S. bishops. 4:15 p.m.: Canonization Mass at the Basilica of the National Shrine of the Immaculate Conception. 10 a.m: Pope Francis makes a speech in English to the Senate and House of Representatives in a joint session of Congress. 11 a.m. Brief appearance on West Front of the Capitol. 11:15 a.m.: Visit to St. Patrick's Catholic Church in D.C. and Catholic Charities of the Archdiocese of Washington. 4 p.m: Departure for New York from Joint Base Andrews. 5 p.m.: Arrival at John F. Kennedy International Airport. 6:45 p.m.: Evening prayer service at St. Patrick's Cathedral. 8:30 a.m.: Pope Francis meets with the United Nations General Assembly. 11:30 a.m.: Multi-religious service at 9/11 Memorial and Museum. 4 p.m.: Visit to Our Lady Queen of Angels School in East Harlem. 5 p.m.: Procession through Central Park. 6 p.m.: Mass at Madison Square Garden. 9:30 a.m.: Arrival in Philadelphia. 10:30 a.m.: Mass at Cathedral Basilica of Saints Peter and Paul. 4:45 p.m.: Visit to Independence Mall. 7:30 p.m.: Visit to the Festival of Families at Benjamin Franklin Parkway and prayer vigil with the World Meeting of Families. 9:15 a.m.: Papal meeting with Bishops at St. Martin's Chapel of St. Charles Borromeo Seminary. 11 a.m.: Visit to Curran-Fromhold Correctional Facility. 4 p.m.: Mass with the World Meeting of Families. 7 p.m.: Visit with organizers, volunteers and benefactors of the World Meeting of Families at Atlantic Aviation. 8 p.m.: Pope Francis departs for Rome.